Although small in stature geographically speaking, Nepal is a county that is blessed with an overabundance of adventure travel opportunities. Whether you're hiking or climbing in the mountains, spotting wildlife in Chitwan National Park, or whitewater rafting on a raging river, there are numerous activities that are guaranteed to get your heart pumping. Of course, most travelers that visit Nepal come for the amazing trekking, with the hike to Everest Base Camp standing out as a true bucket-list achievement amongst veteran adventurers. But as iconic as that journey is, it may take a backseat to another Nepali trekking route that is even longer, more challenging, and more beautiful. Stretching for up to 145 miles through the snow-capped Himalaya, the Annapurna Circuit is the standard by which most other trekking routes around the world are measured. It is easily amongst the best hiking routes in the world, but before you commit to exploring it yourself, here's what you need to know. Located in central Nepal, the Annapurna Circuit is a long-distance trekking route that begins in the town of Besisahar and ends in Birethanti, encircling much of the Annapurna Massif along the way. The trail's namesake mountain is amongst the tallest in the world, standing some 8091 meters (26,545 ft) in height. This beautiful and majestic peak looms larger over large sections of the trail, providing a spectacular backdrop for a hike that is already well known for its natural beauty. The trail first opened to hikers back in the late 1970s, but truly gained its legendary status amongst adventure travelers in the '80s. It was around that time that development in the area started to take off, making it easier to travel to and from the Annapurna region. The city of Pokhara also blossomed into a mecca for backpackers, serving as a gathering point for those looking to hike the Himalayan route. Today, the Annapurna Circuit is amongst Nepal's most popular trekking routes, drawing thousands of hikers on an annual basis. Most come for the spectacular beauty that can be found along the trail, which includes small villages spaced out over few hours with accommodating tea houses offering good food, thirst quenching drinks, and a warm, cozy place to spend the night. As with all adventures that take place in Nepal, the journey begins and ends in the country's capital –– Kathmandu. The city is noisy, chaotic, and colorful, with plenty of attractions to keep visitors busy in its own right. The historic temples, famous markets, and eclectic restaurants are certainly worth a look. 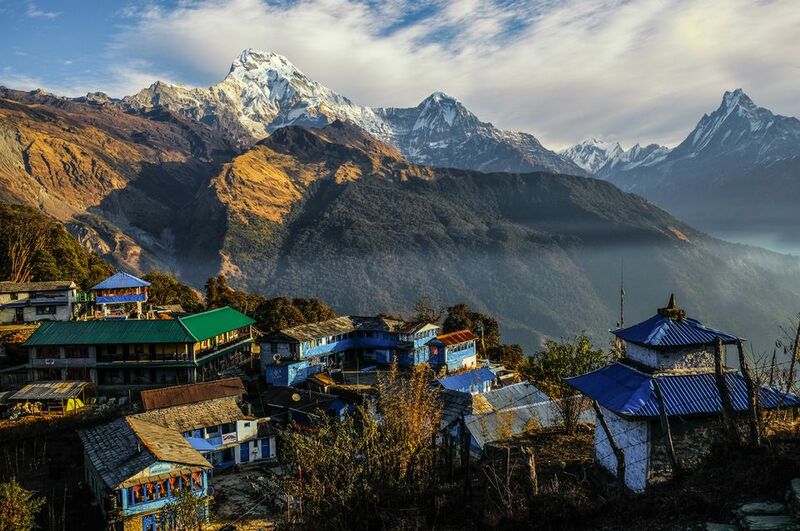 Once trekkers are ready to hit the trail however, they'll most likely fly to the city of Pokhara in central Nepal, which is located close to the start of the Annapurna Circuit. From there, they need to book ground transportation to nearby Besisahar to begin the trek. Alternatively, travelers can take a bus directly to Besisahar from Kathmandu, skipping Pokhara altogether. The ride is about seven hours in length, but offers some great views of the Nepali countryside while en route. There are two distinct hiking seasons in Nepal, with one coming in the spring and the other in the fall. The absolute best time to hike in the Himalaya is in October and November, shortly after the monsoon season has ended. Typically, the weather is warm, with clear skies, and few rain showers. Because of this however, it is also the busiest time of the year too. That means the trail can get crowded and tea houses will sell out quickly. If you're visiting during this time of the year, be sure to book early. The second best time to hike the Annapurna Circuit is in April and May. By that time of the year, spring has typically arrived, ushering in warmer temperatures and less snowfall. It is a quieter time on the trail, but the weather conditions can be a bit less predictable with a higher chance of rain or clouds. Still, it is generally a lovely time to be in the Himalaya, with good visibility and excellent hiking. From June to September, Nepal is hit with the annual monsoon, which brings torrential rain to many parts of the country. But the Annapurna Circuit mainly falls in a rain shadow and isn't often hit with heavy downpours. This makes the summer months a surprisingly good time to hike the route, as there are generally very few people traveling in Nepal during that time of year. The downside is that it can be quite warm and muggy on certain segments of the trail, making it an uncomfortable time to be in the mountains. Some adventurous hikers will trek the route in the winter, as the trail is generally all-but deserted at that time of the year. The trade-off is that snowstorms can strike at any time, temperatures can get quite cold, and there is a higher chance of avalanches closing the trail. Only the most experienced backpackers should hike in the Himalaya at this time of the year, as conditions can actually turn life-threatening. Hiking the classic Annapurna route through the Himalaya generally requires about 18 days to complete the walk end-to-end. Some trekkers are able to travel a bit faster, shaving a few days off of that time, while others will move at a slower pace or make side trips, extending the journey a bit longer. The majority of guided treks will stick closely to the 18 day schedule however, which doesn't include travel time to and from Nepal. Add on a few days in Kathmandu at the beginning and/or end, and an Annapurna trek will likely take the better part of three weeks to finish. What Should I Expect on the Trail? The Annapurna Circuit is a well marked and maintained trekking route that is easy to follow. It passes through numerous small villages along its length, giving hikers plenty of options to grab a bite to eat, relax with a drink, or find accommodations for the night. Tea houses are plentiful and small restaurants and shops are not uncommon either. The trail itself features plenty of altitude gain and loss along the way, with starting at 2690 feet in Besisahar and reaching its highest point at Thorung Pass, which tops out at nearly 17,770 feet. It is a slow, but steady climb up to that point, with some steep, but manageable ascents at various points throughout the hike. Go slowly and allow yourself to acclimate to the altitude, particularly in the early days of the trek. There are also quite a few river crossings along the route, most of which are accomplished with the help of a suspension bridge. This adds to the sense of adventure, as some of those bridges are built high above the water, making for some very scenic views and photos. But those who aren't particularly fond of heights will want to keep their eyes focused ahead while moving at a steady pace. While completely safe and well maintained, the bridges can be a bit unnerving on the first crossing or two. One of the reasons why the Annapurna Circuit is much-loved by trekkers is that it seems to only get better with each passing day. The beautiful and dramatic scenery can be incredibly breathtaking, and just when you think it can't get any better, the views are completely surpassed by even better ones the following day. If you're looking for a hike that will provide plenty of sights to see, it's difficult to surpass this one. As mentioned, the traditional Annapurna Circuit begins in Besisahar and ends in Birethanti. In between, the trail wanders through Khudi, Jagat, Manang, Marpha, Tatopani, and numerous other villages and towns, providing a real sense of what it is like to live in the Himalaya. This is part of its appeal as well, giving trekkers a chance to immerse themselves in the mountain culture that has existed there for centuries. There have been some travelers who have lamented the fact that a busy road now runs through much of the Annapurna region, with cynics saying that it has ruined the trekking route forever. While it is true that a road now exists there, much of the path still stays well away from it and some portions have been rerouted to avoid the traffic as well. At the end of the day, this is still one of the best hikes in the world and most adventure travelers don't come away disappointed. Whether or not you hire a guide for your Annapurna Circuit excursion comes down to personal preference. If you are an experienced backpacker who enjoys going it alone, and are looking to save a bit of money, then a guide isn't really necessary. The trail is easy to follow, it's hard to get lost, and there are plenty of places to resupply along the way. For those that know what they are doing, it is a fairly straight forward trek. On the other hand, if you're looking to get the full experience, a guide can come in very handy. Not only will he or she ensure that you stay safe on the trail, they'll also be able to answer questions for you along the way. They can also help translate conversations with locals offer insights into the best places to stay or eat, and help you to avoid stick situations. From time to time trekkers can encounter less scrupulous individuals along the trail and a good guide can help smooth over those situations. An long trek through the Himalaya can require plenty of gear to keep you warm, dry, and comfortable throughout the trip. If you've booked the hike with a guide service, be sure to ask them for a packing list before setting out to ensure that you have everything you'll need. During the two most popular trekking periods –– October through November and April through May –– the days are typically warm, while the nights can be quite cool. That means you'll want to dress in layers, bring a warm sleeping bag, and pack versatile gear that can be used in a variety of environments. If you're trekking independently, you'll find a number of Annapurna Circuit gear lists online. Use these as guide for knowing what to pack for the trip and what to leave at home. The Nepali government requires that all trekkers hiking the Annapurna Circuit carry two permits with them at all times. Those permits are required to even enter the Annapurna Conservation Area and there are multiple checkpoints along the route where authorities will request to see them again. Both the Annapurna Conservation Area Permit (ACAP) and the Trekkers Information Management System (TIMS) card can be obtained in Kathmandu or Pokhara prior to the start of the hike. The ACAP costs about $18/person, while the Green TIMS card, which is for independent travelers, is priced at $20/person. A Blue TIMS card for group travelers sells for $10/person. If you hire a guide they will typically handle all of the paperwork and obtain the permits for you. Nepali regulations require all travelers who are climbing or trekking within the country to have travel insurance prior to setting out on their adventure. Hiking and mountaineering at high altitude comes with some inherent risk, and it is not uncommon for travelers to have to be evacuated or receive medical treatment, and having the proper insurance can help alleviate those costs. Beyond that regulation however, it is just a smart idea to purchase travel insurance when undertaking any adventurous itinerary. You never know when a situation might arise where you might need it, including covering the expenses of lost bags, cancelled flights, unexpected medical expenses, or evacuations. Those are all things you hope to never have to deal with, but the right insurance will limit the impact it has on your trip and wallet should the need arise. The Annapurna Circuit can be a challenging hike, even for those who are already quite fit. In order to enjoy the trek to its fullest, travelers are encouraged to be as physically prepared as possible prior to starting out. Some days are more strenuous than others and altitude is always a concern of course, but the trek will be a more enjoyable one if you have trained a bit prior to traveling to Nepal.